Our medallion series patent display plaques feature a beautiful handcrafted 24k gold-plated USPTO seal medallion with full color enamel detail. 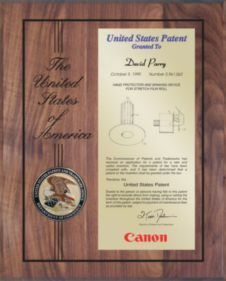 This medallion is mounted on a solid, laser engraved walnut patent plaque and is accompanied by a gold presentation plate imprinted with the front page of your patent. 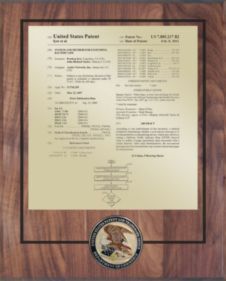 These patent awards feature a keyhole on the back of the patent plaque for easy wall hanging. Each patent display plaque is custom-made to honor the hard-earned IP award. If you don't see what you are looking for, please email one of our IP Award Specialists or call us today to see how we can help you.